We left the house amidst a blizzard and drove over the summit in 8 inches of unplowed highway. “What are we doing?” There’s a sense of wonder, always, when traveling to a hunting spot because rarely can you know what it’ll feel like when your feet hit the ground and you start hiking. Today didn’t look good, but we had planned to do this and, by god, we were going to do it. Plus, a couple of friends had driven from McCall to join us, so we at least had to make the effort. Halfway down into Hell’s Canyon, blue sky and sunshine teased us. “It’s a sucker hole,” Dave said. “You’re a sucker hole,” I replied. “This is for real!” It was for real. My face got sunburned. We had sun all day, with scant clouds. Not a breath of wind. I took my jacket and gloves off within the first ten minutes, and still overheated during the climbs. Two inches of fresh snow that hadn’t been there two days earlier made the hiking softer, and betrayed the movements of birds, most of which were down low. But we kept climbing. At the top, chukar crowed in some rocks above. Peat, Angus, and I made our way up there and, sure enough, within a few minutes Peat locked up, followed by Angus, who then crept his way through a maze of basalt. Angus’s nose and eyes pointed down a narrow chute of rock which I couldn’t see into even though it was just a few feet away. He was a statue, and wouldn’t move and didn’t blink. A canyon wren chatted and hopped around the crags. I waited, having found a two-square-feet level rock to stand on, surrounded by precarious footing. Several silent moments passed. Then, a shockwave of maybe 20 chukar burst from the tight cocoon of rock. Fumbling with my safety, I managed to hit one bird, which fell into the snowy bottom of the steep draw. The dogs ran around below me looking for the bird. They couldn’t find it. I descended, thinking I could help. Although I’d marked the bird, the powdery snow had piled up to about a foot deep and I wasn’t certain it would even be visible, based on the trouble the dogs seemed to be having finding the bird. After a good ten minutes I was ready to give up, but Peat scampered to the termination of the draw, nowhere near where the bird had fallen, and picked it up. He bee-lined straight to me with the bird as if that were his business. No messing around. No damage, no torn tail feathers, no ambivalence, just the bird thank you very much. Not believing this attitude, I chanced giving the bird back to him. He took it in his mouth briefly, and then on “Give,” he dropped it back into my hand without hesitation. Crazy-Eyes had become a retriever. A Christmas Eve Miracle! Yay! Happy holidays to everyone! May your bird hunting spirits be blessed with health, happiness, and grace. Beautiful! A wonderful Christmas eve and a great post too read on Christmas day. Merry Christmas to you! Repetition, patience and determination looks like it is going to succeed with Peat. Well done. What a nice Christmas gift. Good for the pup! I really enjoy your stories. 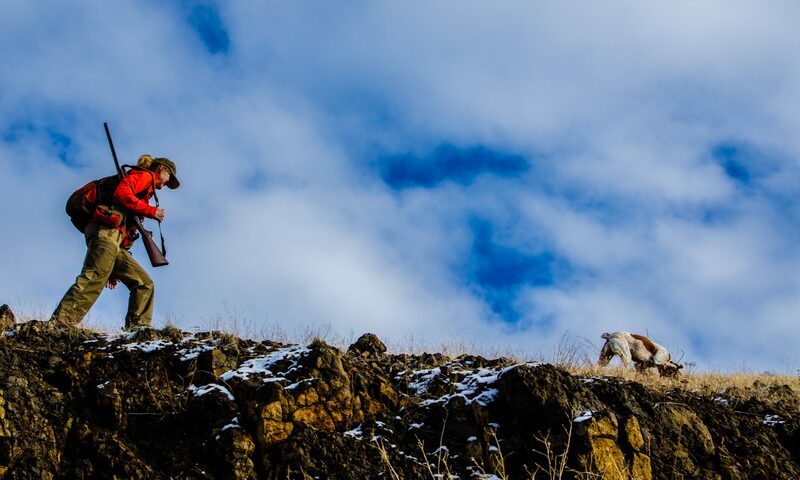 The true ups and downs that we afflicted bird hunters face throughout a season. Merry Christmas to you too Bob. I love reading your blog and hopefully our paths will cross one day in the canyons. I love your posts! How is the road getting down to the canyon? I was thinking about heading that way this next week but am a little worried about getting in there. I have never hunted Hell’s Canyon, mostly I hunt Bruneau. Thanks, Ryan. The road’s okay, a bit icy, especially in the morning. It’s supposed to get really cold in the next several days, so early mornings will be a little dangerous on the descent. Be careful. Way to go Peat! I knew you had it in you.